AIWA XP-V50 Personal CD Player. Tested Working. OVERALL IN VGC. 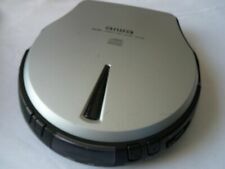 XP-270 Personal CD Player. Tested Working. OVERALL IN VGC. Good quality player fully working and in very good condition. Includes Instruction Manual (has small amount of writing on back page). Condition: Used, tested and working. This ad is for an Aiwa XP-V310 personal CD player. These don't seem to be around in this condition-I'm guessing this is from early Noughties, poss late 90s. I t will need 2 batteries. Aiwa XP-R970 Box And Charger Only. Condition is Used. Dispatched with Royal Mail 1st Class. This is a superb example Aiwa sound quality portable CD player from the early 1990's. Sound quality is very crisp and clear which incorporate Aiwa's proprietary DSL bass boost in 2 levels (Mid/Max). This player has been tested and is in perfect working order. WE HAVE NO FACILITIES FOR COLLECTION. Exact CD Player pictured rare model as has the WARNER MUSIC UK ALPERTON stamped on the front. Aiwa XP-V50 Personal CD Player. Have listed as new other, has spent its life in its original retail box. Was used briefly years ago but been in storage ever since. Comes complete with cable to plug in, as well as instruction manual. 14 hour play back time, not bad for a retro bit of kit! Everything works as it should and was tested through my amplifier as well as headphones. Tiny bit of rubbing to the silver on top left hand side, from rubbing inside the box I believe during the many times it’s been carted around over the last decade or so! Will be well packaged when sent out to avoid any damage. Many thanks for looking. Blast-off with mind-blowing sound with this in-dash receiver from Aiwa. 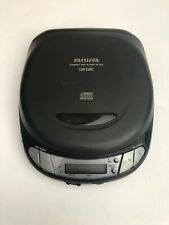 You also have the option to use the front auxiliary input jack to connect a portable MP3 player, MiniDisc, or cassette player. Aiwa XP-220 1 bit DAC Personal CD Player. Fully working tested unit. mains adapter not included. DSL-Dynamic Super Linear Bass. Backlit LCD Display. CASSETTE FUNCTION DOESN'T WORK. THE SOUND COMING OUT OF EARPHONES IS QUITE LOW. Manufacturer - AIWA Co., Ltd. in Indonesia. Features Anti-Skip Buffer. MUSIC LOVER ! Everything you need for hours of great music. Condition - Overall good condition, takes Lithium batteries. Custom Bundle No. The discman is used. It is tested and works. Product Line Discman. Color Black. Custom Bundle No.